Granville Island is one of Vancouver, BC's top 10 attractions, hosts one of the city's biggest Canada Day celebrations (July 1), and is home to the famous Granville Island Public Market. While it may--at first glance--seem to visitors that Granville Island is "touristy," it's far more than that; it's beloved by locals, who routinely shop, dine, and go to the theatre here, and plays a central role in Vancouver life. Getting there: Granville Island is located on False Creek, under the Granville Street Bridge, just south of downtown Vancouver. You can get to Granville Island by bus, Aquabus (which will take you across False Creek from Yaletown), on foot/bike, or by car. If you're driving, the main street entrance to Granville Island is at the junction of Anderson St. and Lamey's Mill Rd. On-site parking is available; there is both free parking (for one to two hours) and paid parking. One of the top places to shop for kids in Vancouver, the Kids Market on Granville Island is located next to the street entrance. The multi-story Kids Market is home to a variety of kid-focused shops--including toy stores, costume shops, and kids' fashion--that are as fun for adults as they are for kids. Along with the shops, the Kids Market is also home to the indoor Adventure Zone play area. Number one on anyone's list of top things to do at Granville Island is the Public Market. Home to 100+ vendors, the Granville Island Public Market is packed-to-the-rafters with fresh (usually local) produce, seafood, and meats, has loads of prepared foods (so you can have a picnic outside / dine inside at their food court), and lots of (often locally-made) arts and crafts. It's a must-visit for anyone traveling in Vancouver. Tip: Be prepared for crowds! The Market is often so crowded that strollers and wheelchairs may find it difficult to navigate. Love beer? Especially local beers? In 1984, long before Vancouver's craft beer explosion, Granville Island Brewing opened Canada's first microbrewery on Granville Island. Today, you can tour the facilities (and taste their wares), grab a pint in the bar, or buy souvenirs at their store. The beer-tasting is a great way to meet fellow travelers (and potential drinking buddies), too. If you don't want to eat at the Public Market (see above), there are dozens of restaurants on Granville Island. 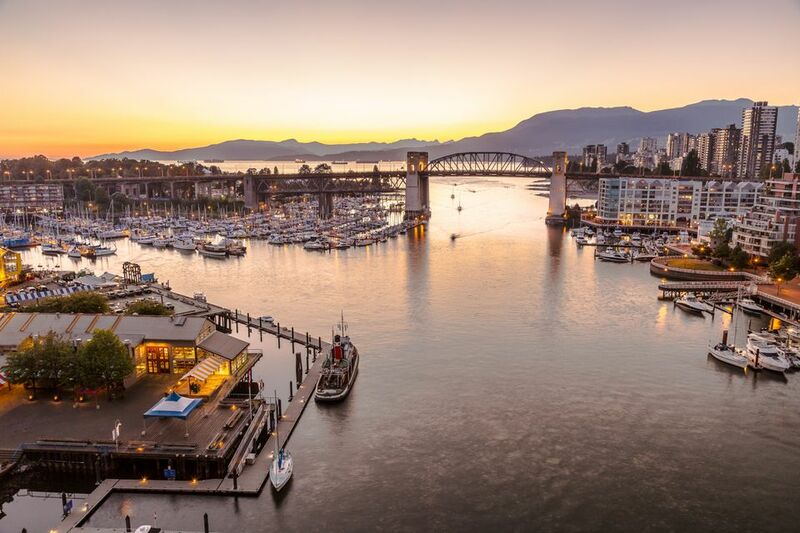 Stand-outs include Edible Canada--one of Vancouver's Best Farm-to-Table Restaurants (and a great place to get info on foodie and culinary tours)--and Sandbar Seafood Restaurant, famous for its cedar plank salmon. The biggest free water park in North America is on Granville Island. Open in the summer only--from Victoria Day (mid-May) through Labor Day (early September)--the Granville Island Water Park, one of the top water parks in Vancouver, is perfect for young kids (10 and under). The Water Park has one large water slide, plus multiple water pipes, fire hydrants, and sprays, with a (mostly) concrete ground (so bring waterproof shoes).